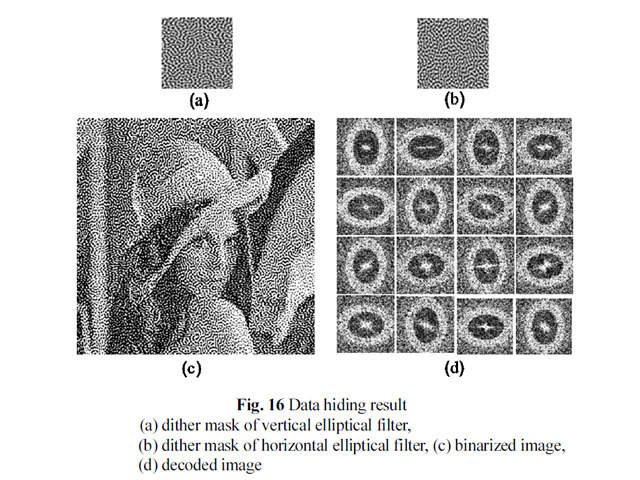 New clustered FM halftone dither mask which represents green to blue noise characteristics has been developed. This mask is generated by spectral filtering operation confining it’s spectrum within f_max and f_min. Firstly, dot profile which represents green-noise characteristics is generated at mid gray level of g = 1/2 , then update the dot profile increasing/decreasing gray level of g ±Δg with controlled f_max and f_min values, which approach to blue-noise characteristics toward g → 0 or 1. Finally dither mask is obtained after accomplishing whole gray levels. This dither mask provides green to blue noise characteristics with stable f_min, or constant principal wavelength for wide gray levels, so that it provides high quality and stable clustered halftone dot for all gray levels. Furthermore, the color moiré pattern that caused by superposition of CMY color plate is reduced by the use of suitable type of dither mask for each color plate. As another application, invisible data hiding for printed material is examined using different spectrum of stochastic dither masks.